Finding different varied ways of getting your best players the ball in a position they’re most comfortable with is one of your most important jobs as a coach. 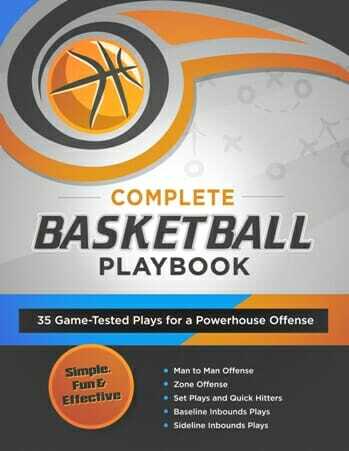 If you always run the same sets, defenses will be able to adjust and gameplan for you fairly easily. That’s why aside from your go-to offense, you should keep several sets in your back pocket for special situations. And when you’re trying to change the pace, one of my favorite sets to run is the stack. It’s extremely versatile, and puts the defense in a position they aren’t used to defending from. 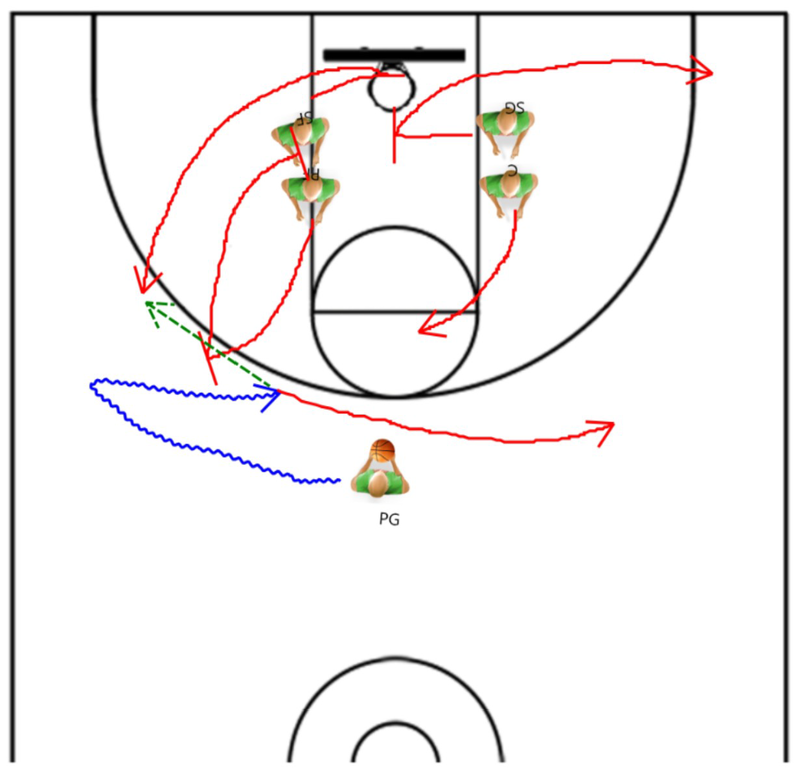 One of the most common plays you’ll see run from the stack is a baseline exchange between the two wings. With either the bigs setting screens for the wing players, or one wing player setting a screen for the other. That’s why this fake baseline play works so well, as with combined with the screen and roll action up top, the defense will have a very tough time covering all the options. To start off, have your point guard set up at the top of the key, with your center and shooting guard on the left block, and your power forward and small forward on the right block. 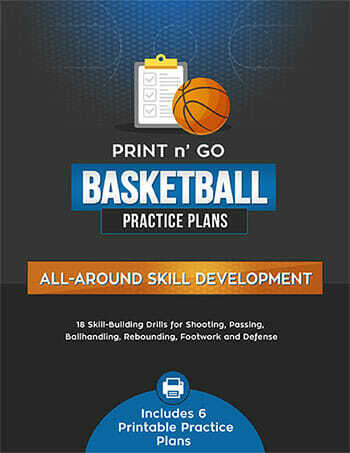 The point guard will then dribble over to the left wing. As this is happening, the small forward will step underneath the basket, settting a screen for the shooting guard. 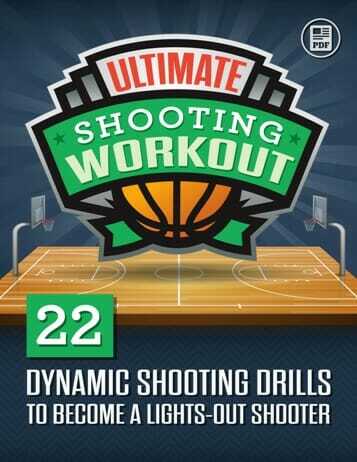 The shooting guard will then take two steps towards the screen, and v-cutting back out to the wing. 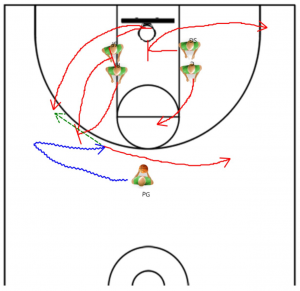 The center will take his cue on the shooting guard’s movement, sprinting to set a ballscreen for the point guard back towards the middle of the key. As the center rolls to the hoop, the point guard will make the pass to the shooting guard coming up to the wing and drift out towards the opposite wing. The power forward will slide up to the right elbow, as well as the small forward, who will now release from his fake screen into the far corner. That’s all for today, but if you’re looking for more offense to add to the playbook, check out another personal favorite of mine! And if you want a bigger selection, there’s always our entire play archive! Don’t forget to comment and leave any questions below!